This entry was posted on 20th January 2017 by Tom Richardson. Sometime during the summer last year my wife Janet and I realised that for this year at least we might be able to escape the glitter, tinsel and mince pies of the festive season and quietly sneak off to Nepal for Christmas and New Year. Our plans were to spend Christmas Day in Namche Bazaar, the de facto Sherpa capital. We would do two treks. 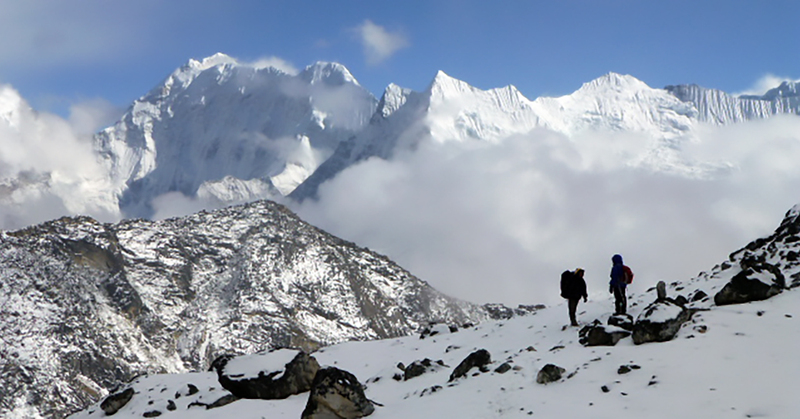 One in the Gokyo area and another up towards Everest, returning to Namche for New Year in between. After trekking we would return to Kathmandu and spend a few days visiting friends. Including Phanden Sherpa and his family who added so much to our Nepal Earthquake fund raising efforts when he was in the UK last summer. For the first section we would be five people. Janet, our friend also called Janet, two porters (friends and neighbours of Phanden’s) called Kami and Nima, and myself. For the second half, our friends Janet and Nima would descend due to a lack of holiday time, and we three would continue. We made Namche our base because despite having no road access it does have 24 hour hydroelectricity, shops and bars etc. For many years the quality of life was far better in Namche than in Kathmandu. Actually I should have said that Namche had 24 hour electricity because the system had failed and the village was without power for more than 10 days. The welcome was as warm as ever but the temperatures and facilities were not. 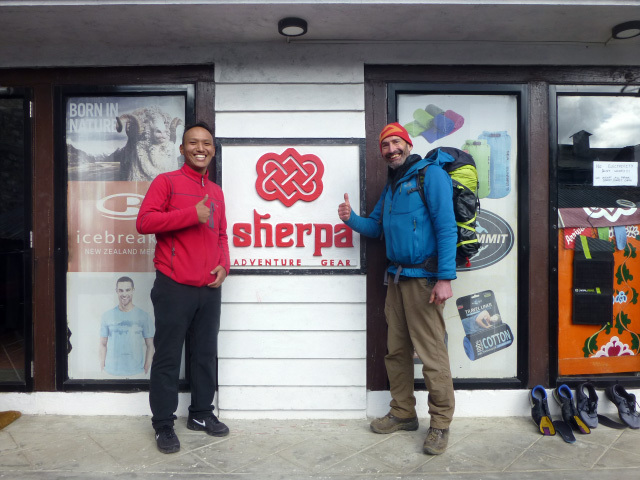 We stayed at the Kangri Lodge run by Tenzing Sherpa, above the Sherpa Adventure Gear shop. 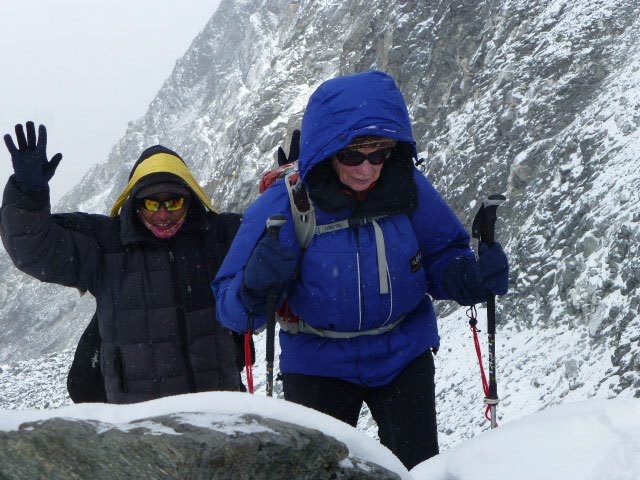 Higher up in the mountains some other trekkers reported temperatures of -20°C. 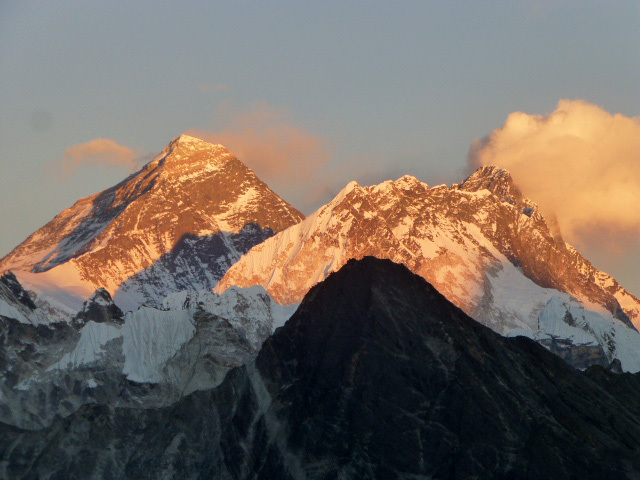 I have trekked up the Gokyo valley many times before but our special treat was to climb the view point Gokyo Ri (5300m) and watch the sun setting on Everest, Lhotse, Nuptse and Makalu. The descent in the dark using headtorches was fun and made all the more so when, just a couple of hundred metres from our lodge, we encountered three pairs of staring eyes lit up by our torches. Jackals on the look out for an easy meal (fortunately not us). On the Everest side we stayed in the village of Dingboche. For people who want to climb Island Peak (6189m) or Imja Tse as it is correctly called, this is the starting point. There are many lodges here but only two were open, we were the only people in one of them. The freezing temperatures caused the barrel full of water used to flush the toilet, to become solid. The highest settlement here is Chhukung where we met a small group of foreigners. They were being guided up Island Peak by a local.They seemed somewhat ill prepared physically, mentally and with their equipment for the cold ascent that lay ahead of them, so I hope they were OK. Having climbed Island Peak many times, it is not to be underestimated. 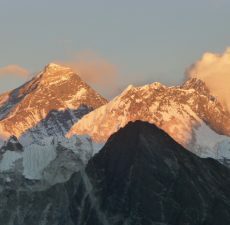 There is more than 1000m of climbing from base camp to summit. Surrounded by glaciers and bigger peaks, it is especially cold. Janet and I went and explored a small (5400m) hill that squeezes between Chhukung and the south face of Lhotse called Chhukung Ri. 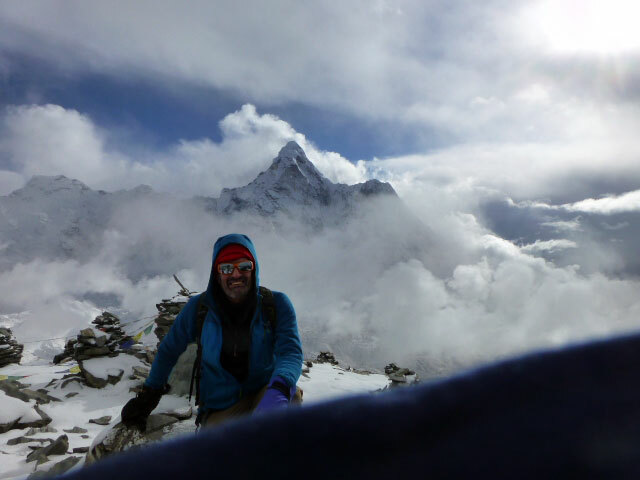 An excellent summit with dramatic views of Ama Dablam, Baruntse and all the surrounding glaciers. For our final objective we aimed to cross a pass between two peaks. 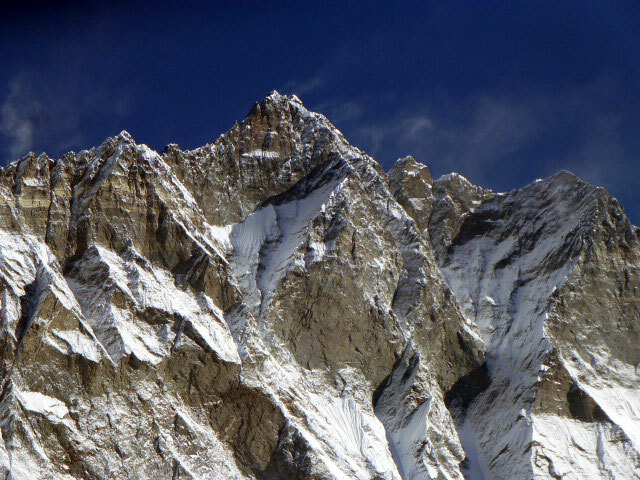 I first climbed this in 1991, Kongmatse (5820m) and Pokalde (5806m). For a while Pokalde was quite a famous mountain. For a charity event two of my friends had guided Sarah Ferguson to the summit. In the main trekking season the pass is a steep rocky ascent. Waves of hard ice and snow covered the boulderfields in mid winter. The top of the pass, the Kongma La is quite sharp with a steep drop off the other side. Definitely not a place to slip, so looking at the stunning view has to be done before leaving the top or after arriving at safety lower down near a small lake below. Some days later, after trekking down to Lukla we made the short scenic flight back to Kathmandu. With one final celebration, my 62nd birthday. Now that’s what I call a Christmas Holiday!